When the male hummingbird arrives in the spring from the wintering grounds in Central America, he establishes a territory containing several sources of food. Because these food sources are of great importance, the area may be shared by other males as well as females. Both the males and the females aggressively defend their food supply and its surroundings against intruders. These encounters lead to persistent swift pursuits that sometimes develop into fighting. The tiny bird uses speed and the hum of its wings to intimidate intruders. It employs certain flight patterns in these aggressive displays. In one, the bird makes a speedy dash, describing a horizontal U, from side to side around the intruder’s ears. In another, the bird swings vertically up and down like a pendulum. Both flight patterns are accompanied by high squeaky notes, and the bird’s wings hum like an angry bumblebee. 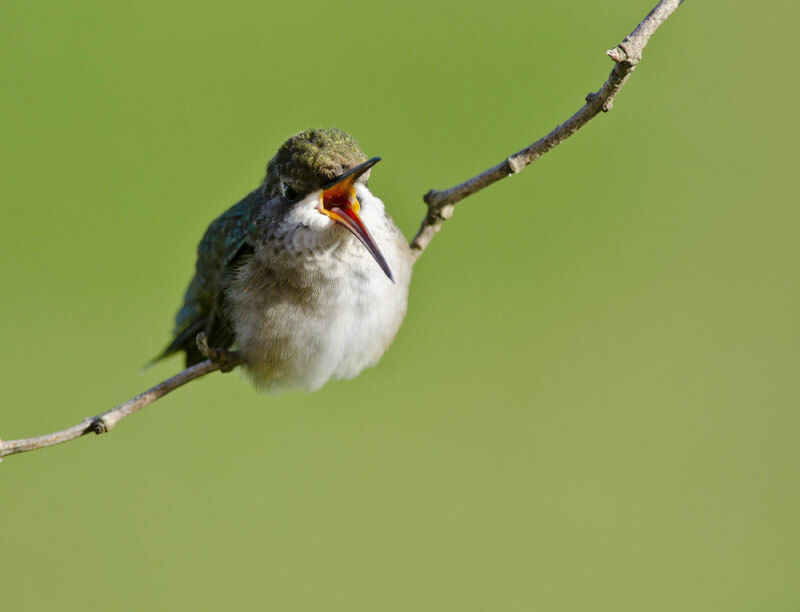 The Ruby-throated Hummingbird is persistent and continues to worry the intruder until it has had enough and flees. 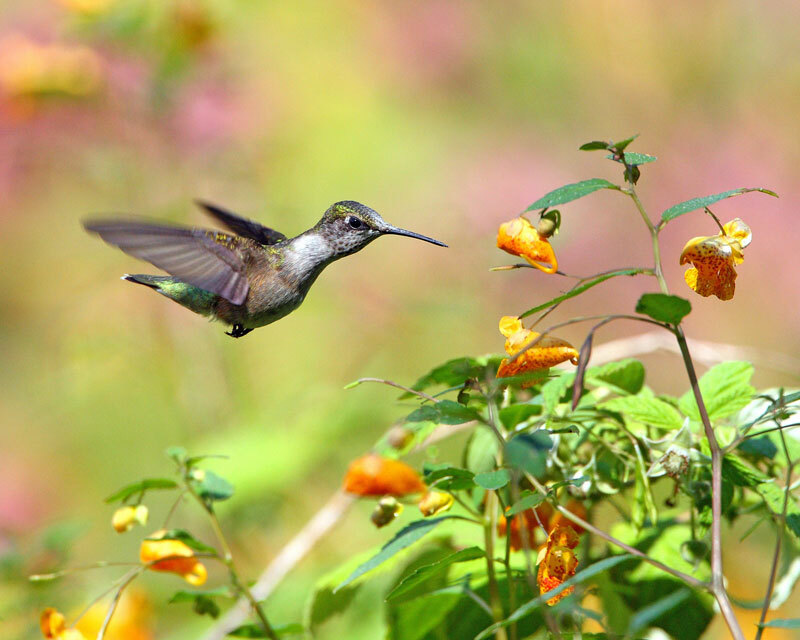 The Ruby-throated Hummingbird’s minute size, its skilful flight, and its migration set it apart among birds. 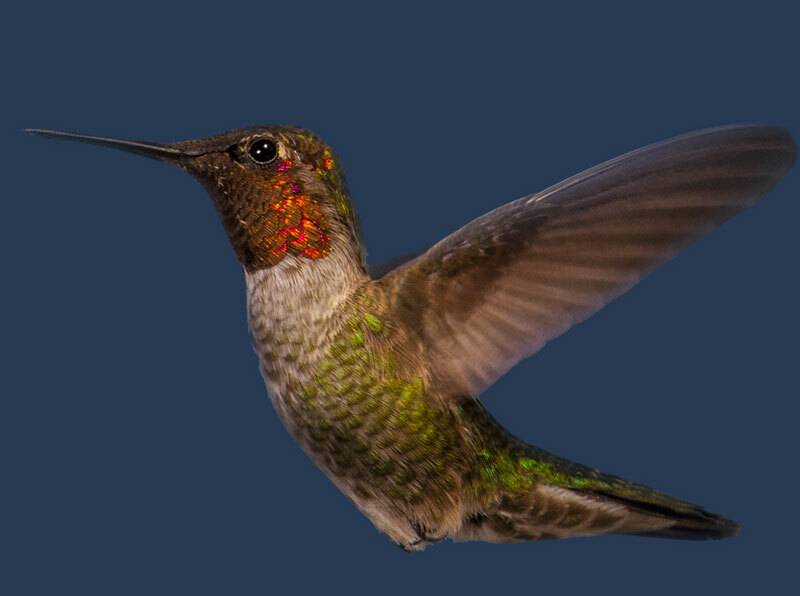 The most remarkable feature about the hummingbird is its flight. It manoeuvres at incredible speed, rapidly changing direction in the air and darting away like a tiny green arrow. Unlike other birds, it can hover in place in the air. Its pointed wings appear to be a blur in flight. Scientists have been able to establish the rate of the wingbeats, by means of high-speed photography, at about 55 to 75 beats a second. 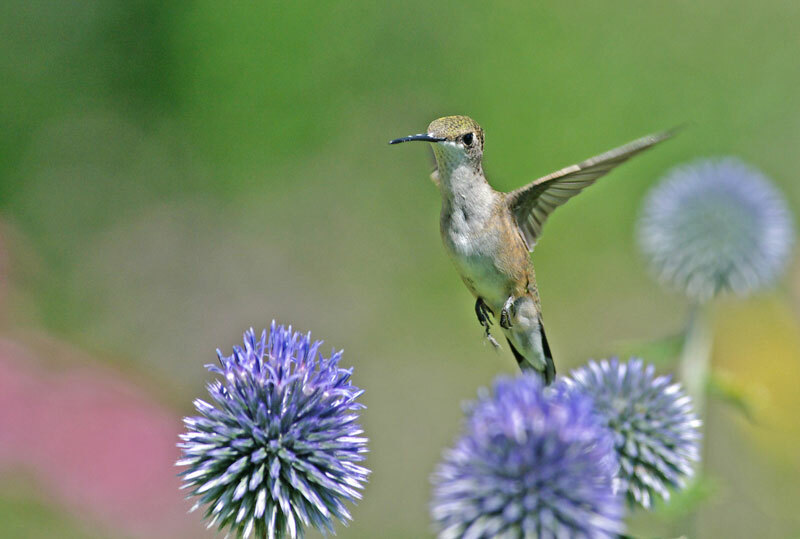 Canada has five species of hummingbirds. 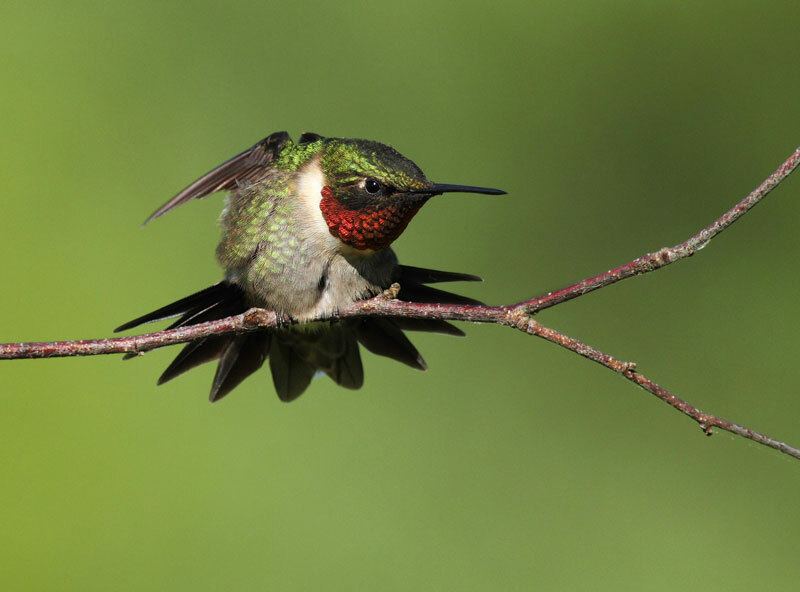 Of these, only the Ruby-throated Hummingbird is found in the east. It inhabits Nova Scotia (including Cape Breton Island), New Brunswick, Prince Edward Island, southern Quebec, and Ontario north to Lake Nipigon and Lake of the Woods. It ranges westward through southern Manitoba, central Saskatchewan, and central and southeastern Alberta. The other species are found in the west. Most common is the Rufous Hummingbird Selasphorus rufus. It breeds in British Columbia north through the Queen Charlotte Islands and northwest to the Alaska border, and east to southwestern Alberta. It ranges, rarely, as far north as southwestern Yukon and as far east as southwestern Saskatchewan. The cinnamon-red male has a shiny green patch on top of the head and a scarlet gorget, or throat patch, that sometimes appears black. The female is bronze-green above, with reddish brown areas on flanks and tail and sometimes a small red and green spot on the throat. The Calliope Hummingbird Stellula calliope is the smallest bird in Canada. It breeds in the interior of British Columbia, east into the mountains of southwestern Alberta, and wanders rarely into southwestern Saskatchewan. The male is shiny green above with a purplish streaky-looking gorget. The female is bronze-green above and has a few dusky streaks on the throat and buffy brown sides. The Black-chinned Hummingbird Archilochus alexandri is a scarce breeder in the southern interior of British Columbia. 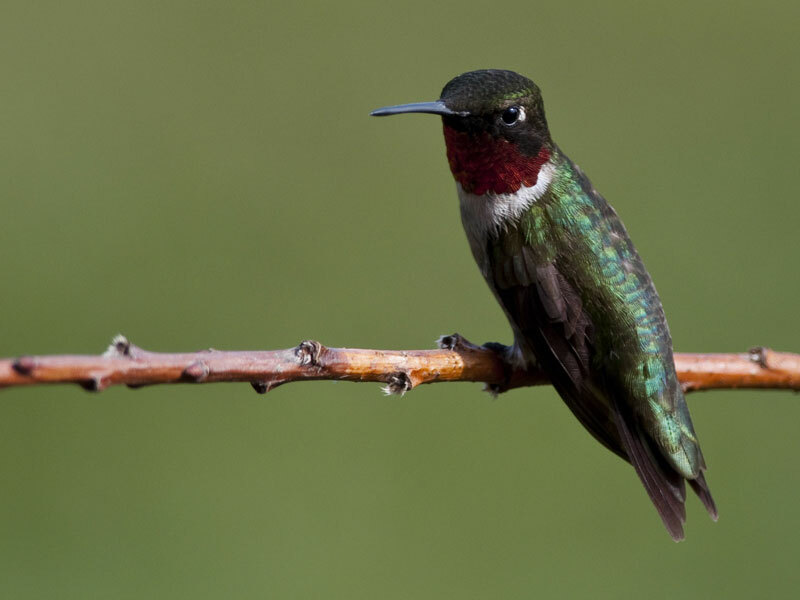 It resembles the Ruby-throated Hummingbird, but the male’s gorget is deep violet changing to black. Anna’s Hummingbird Calypte anna is the largest hummer in Canada. The purplish-red throat patch of the male extends down the sides of the neck as well as onto the crown of the head. The rest of the body is greenish. It is a rare breeder in southern coastal British Columbia. In earlier times people did not believe that a bird so small and fragile could fly thousands of kilometres from its breeding range in the north to its wintering breeding grounds in Central America. This gave rise to the legend that the tiny birds travelled as passengers on bigger birds, such as the Canada Goose. 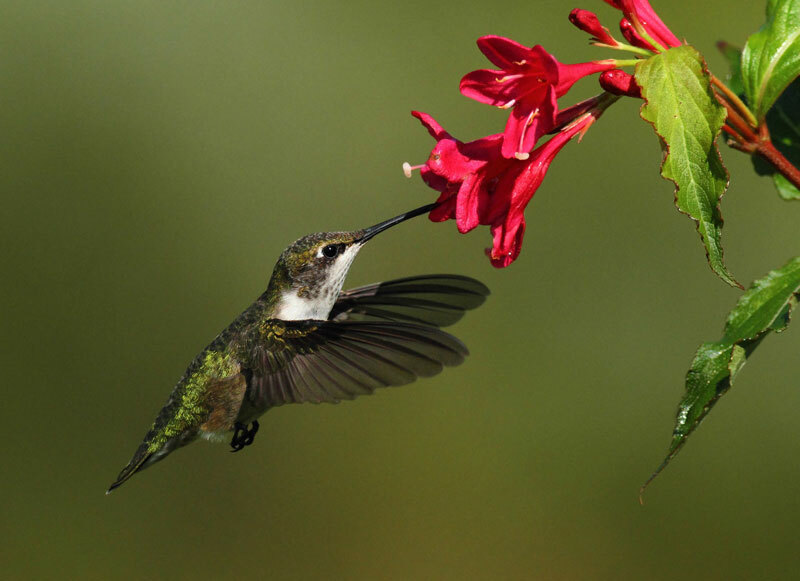 We now know that Ruby-throated Hummingbirds do fly south in the fall and north in the spring. Observers have seen spectacular flights of these tiny birds flashing by overhead in great numbers at such places as Point Pelee and Port Stanley on the Great Lakes, especially in the fall. It has also been established that hummingbirds actually cross the 800-km expanse of the Gulf of Mexico on their way to and from their wintering grounds. Ruby-throated Hummingbirds leave their northern breeding grounds during the second half of August and the first week of September. The males migrate first, followed by the females and the juveniles. They return in the same order in spring, during the last two weeks of May. Data from bird banding (tracking birds by placing numbered aluminum bands around their legs) have showed that birds return to the very same place the next spring. 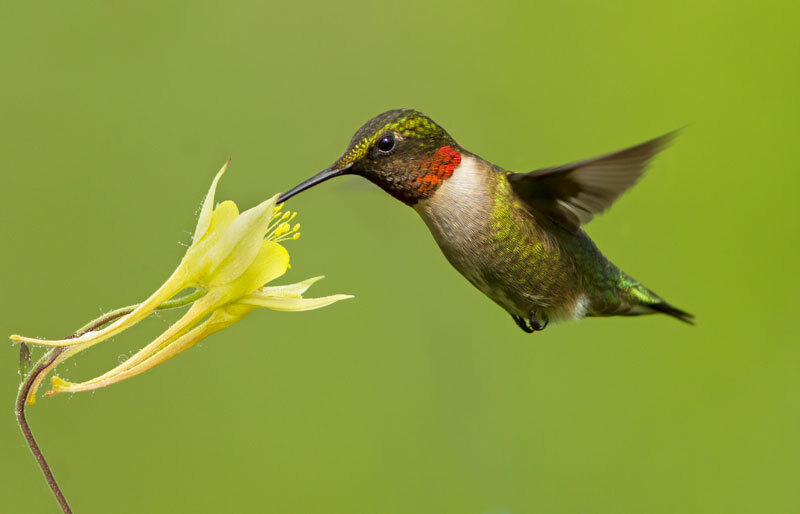 The Ruby-throated Hummingbird’s principal food consists of small insects and the nectar, or honey-like sap, of flowers. The insects are caught on the wing from lookout perches or in and around the flowers. 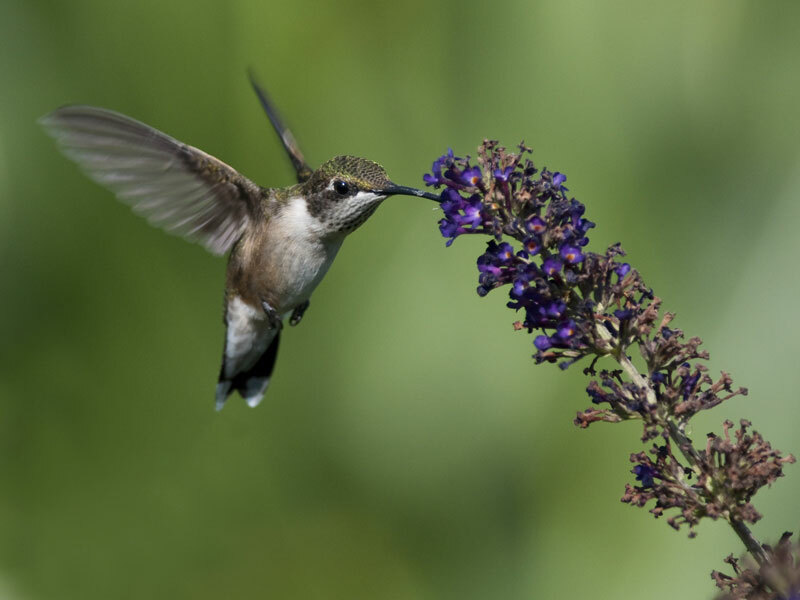 To extract the nectar, the bird inserts its long extensible tubular tongue deep into the honey wells of the flower, preferring tubed flowers, such as bee balm and columbines. When feeding from a larger flower with a very deep honey well, such as a tiger lily, it pierces the calyx, or neck of the blossom, with its bill and by this shortcut extracts the drop of nectar. 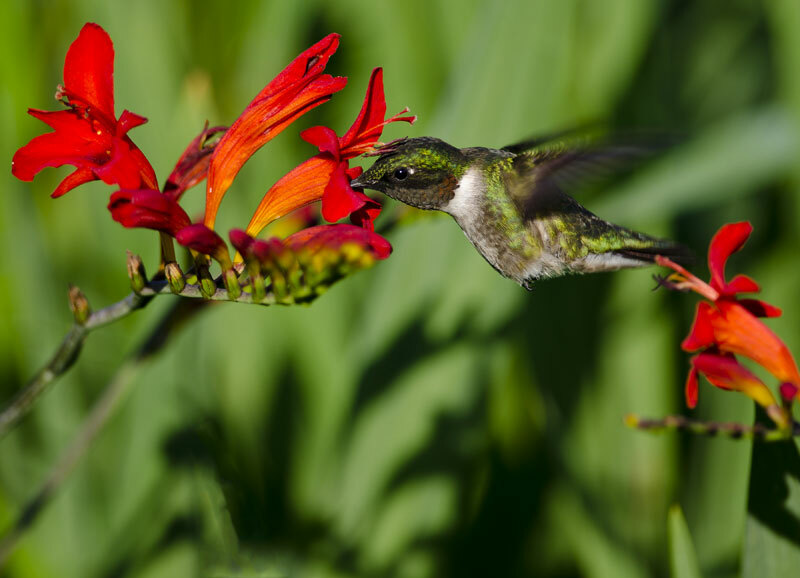 Bright-coloured flowers that contrast sharply with the background attract the hummingbird. It favours red flowers, followed by orange, both of which show up well in dark shady places, and visits green flowers only when the background foliage is another colour. 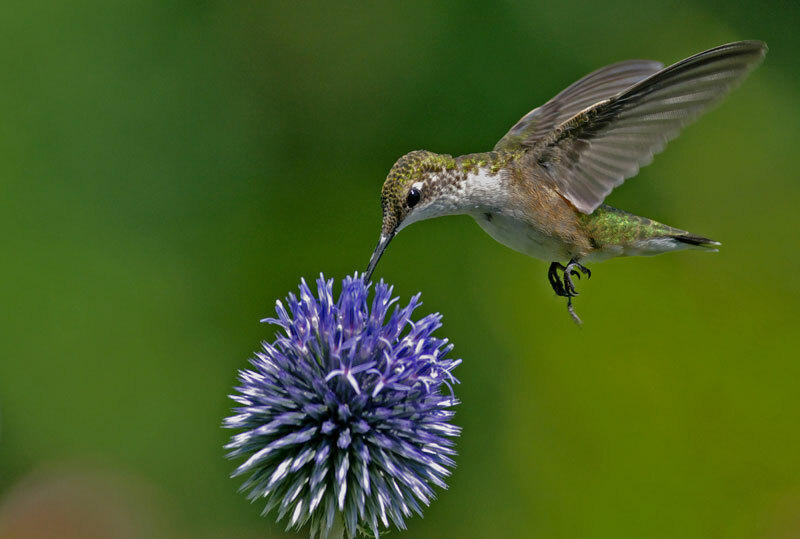 The hummingbird, like the bee, contributes to cross-pollination. As it visits one flower it is dusted with pollen, which it carries to another flower of the same species. Holes made by the Yellow-bellied Sapsucker often release the sap of trees, which is also an important food source. The Ruby-throated Hummingbird is often seen gently buzzing a sapsucker in the expectation of being led to another food source. 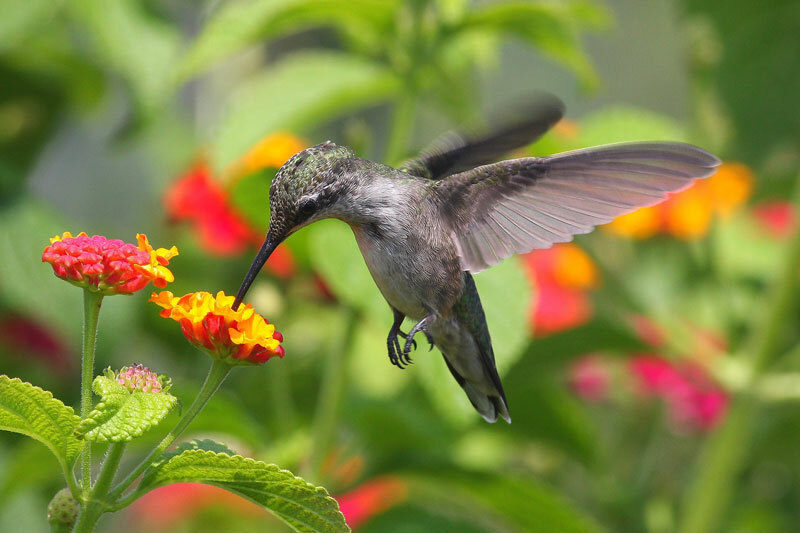 Hummingbirds are easily attracted to feeders containing a solution of one part sugar to four parts water. This should be boiled to prevent fermentation, and the mixture should be changed at least once a week. The hummingbird is a curious creature. Some birds take to a feeder at once; others learn to associate the strange contraption with sweet food only with difficulty. But once a hummingbird finds a feeder it will go back to it, as long as it is hanging in the same place. A hummingbird returning in spring always looks for the feeder where it last fed from it eight months before. The hummingbird also drinks water. Flying across open water, it may descend like a swallow to the surface, touching it with the bill and leaving widening rings on the water to mark the site of the drink. 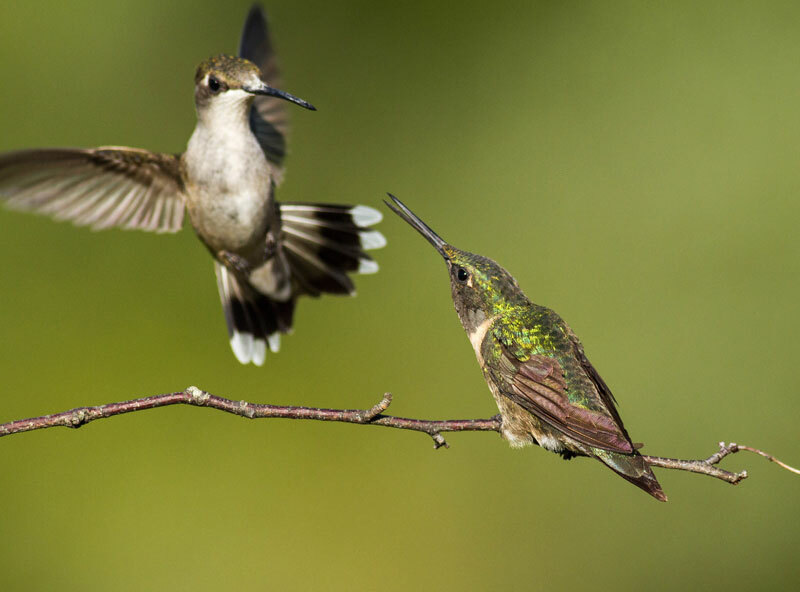 A spectacular feature of the Ruby-throated Hummingbird’s courtship behaviour is the male’s famous pendulum display, an elaboration of the aggressive flight display. The male dives down towards the resting or feeding female. Like a pendulum he sweeps past her and up to a point 2 to 3 m in the air, then back along the same path in reverse. He repeats this swinging display time and again, all the while uttering squeaky notes. As he dives past the female his wings hum the loudest; as he swings closer to the female his hum becomes more intense and his speed increases. Abruptly, the display ends; both dart off together, to start again elsewhere. After the pair has mated, the male takes no part in raising the young. He spends his time darting from flower to flower, sipping nectar, or sitting for hours atop a selected lookout watching for small insects. The female builds the nest without help. She usually saddles it on a limb of a leafy tree or shrub, 3 to 10 m above ground. A skilful builder, she uses cobweb and plant down, such as the fluff from catkins and cattails, as nesting materials. Working with her bill, she cements these materials together and lashes the structure securely to the branch with sticky spider silk. She picks bits of lichen and sticks them on to the outside walls. This gives the nest the appearance of a natural knob. With her body she moulds the inside of the cup and then draws loose ends over the edge and smoothes it all out with her bill. The Ruby-throated Hummingbird lays two white eggs, the size of large peas. The female spends long sessions incubating, or warming, the eggs until they hatch, sheltered from rain and sun by the umbrella of green leaves under which she has placed her nest. 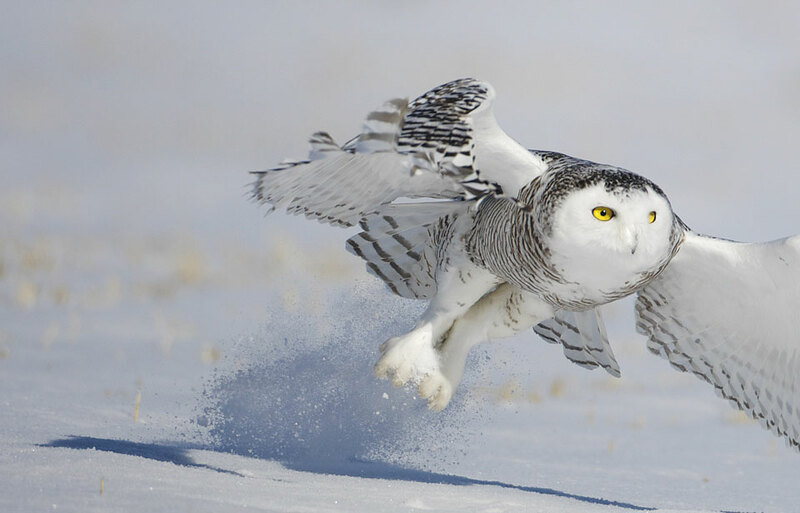 She leaves to feed only briefly, and her trips from and to the nest are cautious, stealthy, and by selected routes. The nestlings hatch after 11 to 14 days. No longer than honeybees, they are almost naked. Their eyes are closed at hatching and their bills are short. After five days their eyes begin to open and their feathers start to develop. Later, the nestling can utter longdrawn peeps. The female broods, or keeps them warm, feeding them from her bill with food regurgitated, or brought up, from her throat. She picks up the droppings and carries them away. Observers noted that one female had trimmed the nest branch with droppings placed in a neat row. The young birds leave the nest after 14 to 28 days, but may continue to be fed by their mother for several days. Now she passes the food directly in an extraordinary performance of chases and hoverings ending with a quick perching manoeuvre in which she squirts nectar from her bill into the chick’s mouth. At this time the fledglings look like the female, except that the young male’s throat is streaked with dusky and, occasionally, red colour. In the spring before migrating north, both adults and juveniles go through a complete moult, or shedding of old feathers, from which the young birds emerge in their full adult plumage. Generally speaking, populations of Ruby-throated Hummingbirds across Canada are healthy. However, poor weather, including storms and untimely frost, sometimes pose serious threats. 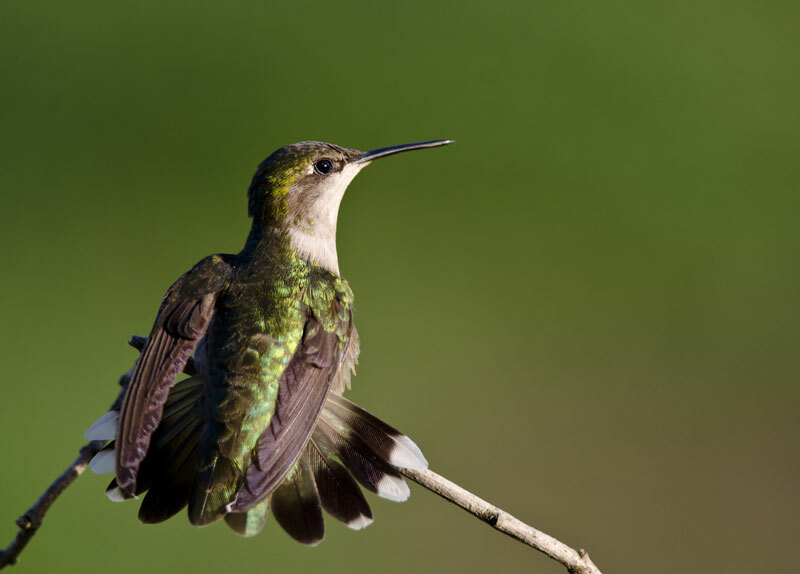 Accidents also may occasionally play a significant role, as hummingbirds can be caught in spiders’ webs or impaled on sharp objects. Finally, predation can threaten these birds. Because they may resemble large insects, hummingbirds are vulnerable to predators such as insect-eating hawks. Also, there is one record of a hummingbird flying over a pool being caught and swallowed by a fish. 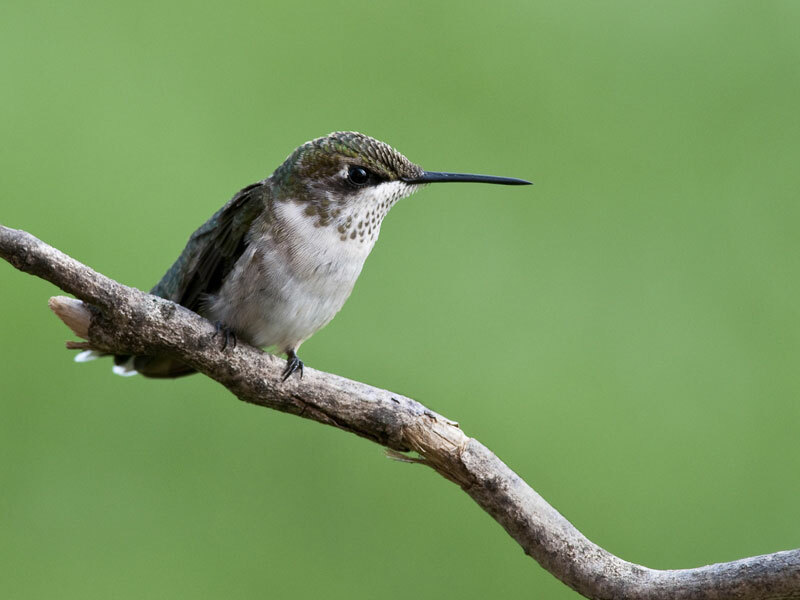 Although hummingbird feeders draw this tiny bird to our backyards, feeders are often placed too close to windows. 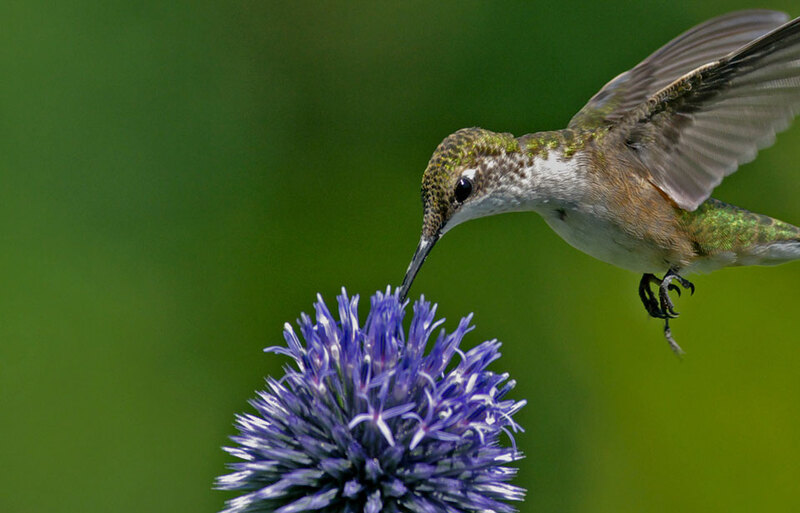 Since hummingbirds are highly aggressive and protect these food sources, they may mistake their reflection in windows for intruding birds and will attack and injure themselves. Also, like most birds, they may consider windows to be openings through which they can fly. 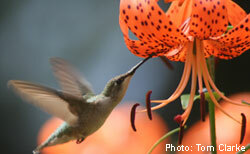 To protect hummingbirds, it is recommended that feeders be placed at least 5-10 metres from windows. Care must be taken in filling and maintaining hummingbird feeders, to ensure that they are a healthy source of food. Don’t use honey, which may make the birds sick, artificial sweeteners, which do not provide nutrient content, or artificial colour. Clean your feeders at least once a week to remove accumulations of mould or bacteria, which may be lethal to the birds. For hummingbird feeder cleaning guides, please check out the Canadian Wildlife Federation’s website. 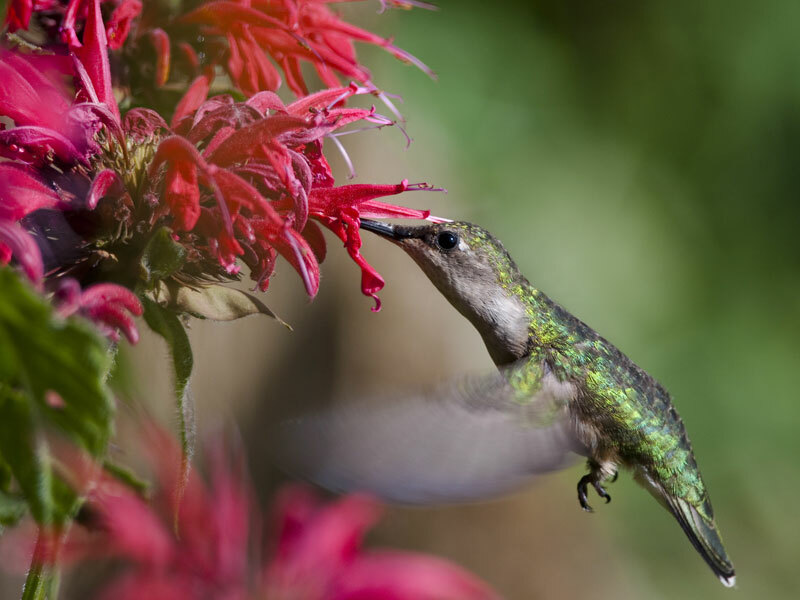 As an alternative or complement to a feeder, why not plant a hummingbird garden? 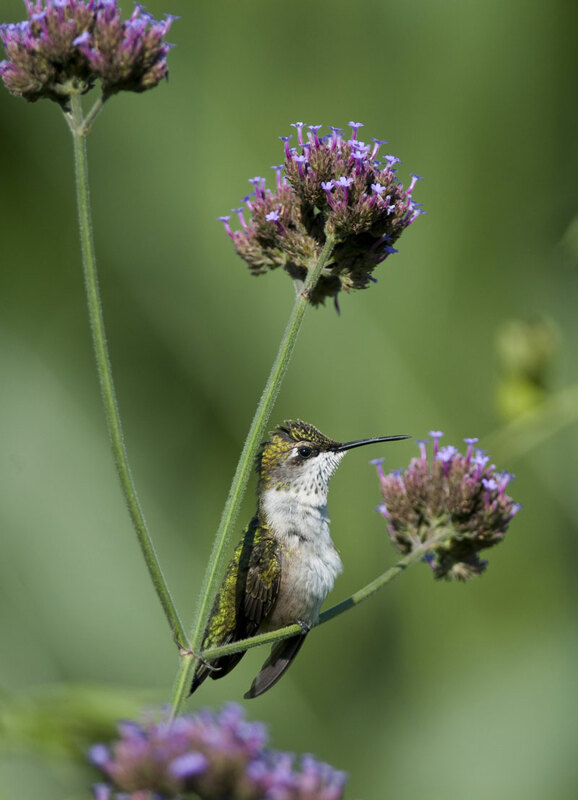 This tiny bird will enjoy the nectar from specific species of flowers as well as the insects in the garden. Bent, A.C. 1964. Life histories of North American cuckoos, goatsuckers, hummingbirds and their allies. Dover Publications Inc., New York. Ehrlich, P.R., D.S. Dubkin, and D. Wheye. 1988. The birder’s handbook. Simon & Schuster Inc., New York. Johnsgard, P.A. 1983. The hummingbirds of North America. Smithsonian Institution Press, Washington, D.C.
Skutch, A.F. 1973. The life of the hummingbird. Crown Publishers, New York. Stokes, D.W., and L.Q. Stokes. 1989. The hummingbird book. Little, Brown and Company (Canada) Ltd.
© Her Majesty the Queen in Right of Canada, represented by the Minister of the Environment, 1974, 1984, 1994, 2007. All rights reserved.